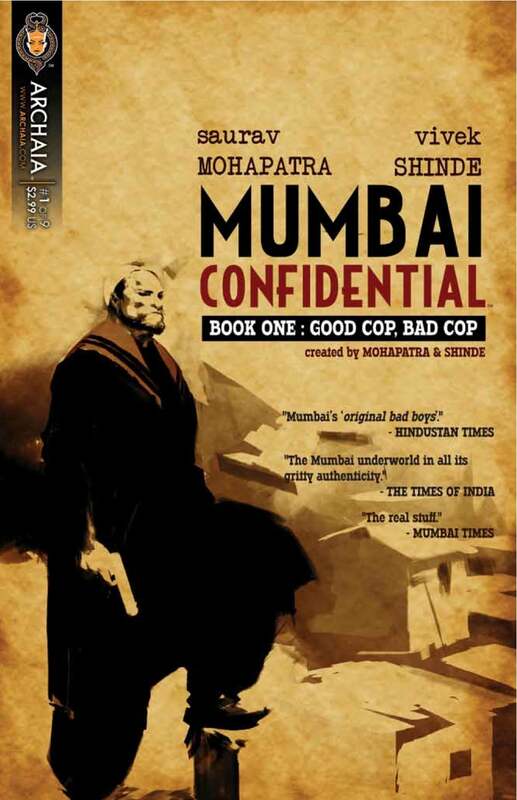 Having just read the first issue of Archaia's Mumbai Confidential by Saurav Mohapatra and Vivek Shinde, it's difficult to get a grip quickly and easily on my feelings for the issue. It's a text-heavy affair at the beginning and end, lending it a feeling of some of those old Strangers in Paradise issues where Terry Moore chose to use the text as part of the art, but it's in fact probably more like Watchmen, where it informs more of the story than just creating a feel. Meanwhile, the interior pages (the actual sequential art) are sparsely lettered. Even on the pages where a lot is being said, there's a feeling that there's a lot of big open space, creating a dark, vacant tableau on the page that really serves the art. Once Kadam was a rising star in the ranks of the Mumbai Encounter Squad, a secret unit tasked with carrying out extrajudicial executions of wanted criminals that turned it into a business for contract killings and extortion. However the death of his pregnant wife at childbirth triggers a downward spiral that leaves Kadam a pale shadow of his former self. That's only about a third of the series' elaborate setup, as described by ComiXology, but I've elected to cut it off there, since frankly the surprising and grotesque final pages are better served coming to you as part of the story, rather than in a block of text clearly meant for the back cover of a collected edition. It's safe to include the last line, "A hardboiled crime-noir tale set in Mumbai and told though the eyes of Arjun Kadam, a washed-out drug-addicted ex-cop," which provides a lot of insight into our hero. This book is absolutely gorgeous. It's cinematic, like a black-and-white film infused with the murkiness of sepia but retaining the shadow and form of black and white. Once the theme of a B-movie gets really rolling in the plot, it will serve the story even better but in this first chapter, it was too beautiful to be a distraction. The dialogue at times, and especially the narration, reminds me a bit of Judge Dredd; it's all very melodramatic, very angry, very vulgar. This is certainly not an all-ages book, with the dreaded C-word even slipping into the dialogue in the first issue, just in case the wrong reader decided to try it out. It sometimes tips over into something that feels a bit like camp, but the fact that the whole thing is set up as a kind of Bollywood film noir makes it work. The character is compelling and the anger and deep trauma that you see in him this issue makes you wonder what makes him tick, and should drive most readers back for more.